The Grand Margherita Hotel Kuching Ramadhan Buffet is one of most established in town. With not less than 100 different kinds local and international food, it is a huge for food lovers. The ambiance at the buffet, particularly during a good day, is second to none. According to Wikipedia, the holy month of Ramadhan is the ninth month of the Islamic calendar. It is observed by Muslims worldwide as a month of fasting to commemorate the first revelation of the Quran to Muhammad according to Islamic belief. Ramadhan usually takes about a month, and its length is highly dependent on the visual sightings of the crescent moon. The word Ramadhan itself comes from the Arabic root ramiḍa or ar-ramaḍ, which means scorching heat or dryness. Muslim would fast from dawn until sunset during this holy month. The end of fasting for the day is known as ‘breaking fast’. In Kuching, and Sarawak, breaking fast is popularly known as ‘Sungkei’. WHEN IS THE GRAND MARGHERITA HOTEL KUCHING RAMADHAN BUFFET HAPPENING? The Grand Margherita Hotel Kuching Ramadhan Buffet dates change in accordance to the month of Ramadhan. Usually however, the Ramadhan Buffet at Grand Margherita Hotel is available from the first day of Ramadhan, until the final day of Ramadhan. The whole buffet itself begins from 6:30PM, and ends at 10:00PM daily, so there’s plenty of time to eat. Ramadhan Buffets in Kuching are usually lavish with food. Restaurants and hotels like Grand Margherita Hotel take the trouble to fly in chefs from outside of Kuching to ensure that the meals are authentic. 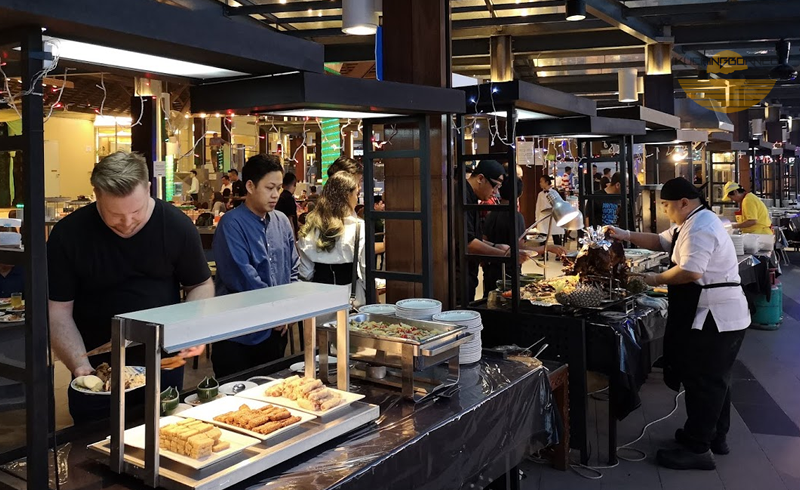 In 2018, chefs from Indonesia and Penang were flown in to serve the best dishes from both Indonesia and Penang respectively. The Penang chefs usually return to on a yearly basis to the Grand Margherita Hotel Kuching Ramadhan Buffet. They bring along their signature Penang dishes like the Penang Char Kueh Tiaw, Penang Loh Bak, Hokkien Prawn Mee Soup, Pasembur and Penang Asam Laksa. Local Sarawakian delicacies also make a regular return yearly with Umai Ikan, Umai Udang, Bubur Pedas, Paru Goreng Rempah, Daging Rendang with Lemang, Wok Fried Golden Prawn, Sambal Tumis Petai with Udang, Ikan Pais, Manok Pansuh, Ekor Lembu Assam Pedas, Cangkuk Manis dengan Labu Kuning Masak Lemak, Nasi Goreng Kampong and Nasi Goreng Dabai listed in the food options. The same goes to international food selections from Western countries and Japan, as well as food served at the live barbecue stations. WHERE IS THE GRAND MARGHERITA HOTEL RAMADHAN BUFFET? 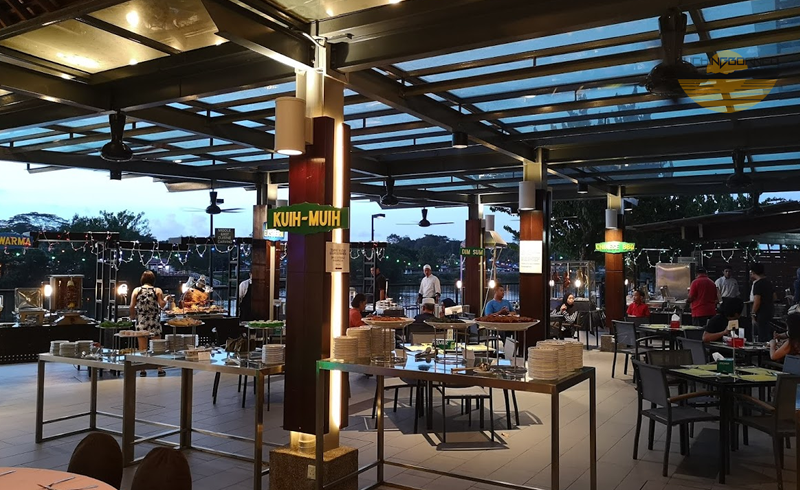 The Grand Margherita Hotel Kuching Ramadhan Buffet is usually hosted at the hotel’s coffee house which is located at the ground floor of the hotel. If you are not sure where Grand Margherita Hotel is located, check out the map below. It should be pretty easy to find. If you enter the hotel from the main entrance, turn right, and walk pass the Rajang Lobby Lounge, hotel lobby and reception desk. Head straight towards the coffee house (the venue of the buffet) which is at the back of the hotel. Alternatively, you can enter the hotel through the Sarawak Plaza entrance. The coffee house is on the right. There is no formal dress-code for a Ramadhan Buffet. However, it is highly advisable to turn up decently, or to opt for a smart-casual attire. Men should avoid shorts, singlets and tank tops while the ladies should choose to avoid sleeveless and revealing clothing. It is unlikely you will be bared from the Ramadhan Buffet due to dressing, but dressing up properly would avoid those unwanted stares. Parking is limited in front of the lobby of Grand Margherita Hotel, but there are always options available. Rates for the lobby parking start from RM3. A good number of parking space are also available above the adjoining Sarawak Plaza shopping centre with rates starting at RM2 per entry, and increases by the hour. If you don’t mind walking a bit, parking behind the hotel is so much cheaper (and free during the buffet time). Since a Ramadhan Buffet is highly tied to Islam, there is a need to be respectful towards the religious beliefs and culture when you attend such a thing. In Kuching, non-Muslim guest are encouraged to respect those fasting even though they are not. Usually, non-Muslims would wait until their Muslim friends start eating before they dig in.If you are not sure when this is happening, observe the moment when Muslims start eating. Food and drinks can be taken before Sungkei, but Muslims appreciate it most when their non-Muslim brothers and sisters refrain from eating until the actual Sungkei time. Another good tip is to avoid food wastage despite the huge spread of food. This can be done by taking appropriate quantity of dishes you want and can finish. There shouldn’t be any worry of food running out as Grand Margherita Hotel has been known to be generous when it comes to replenishing. It is also highly encouraged not to make too much noise during the Ramadhan Buffet. Muslims who want to do their prayers can do so in a dedicated wuduk area near the Ramadhan Buffet area. Since I am not a Muslim, I didn’t check the place, but was assured it was clean and comfortable. My understanding is that their is dedicated prayer areas for both men and women. The Grand Margherita Hotel Kuching Ramadhan Buffet is very spacious. The Original Macam2 Ada Ramadhan Buffet cost only RM93 nett for adults. Children will be charged at RM37 nett. This price is for walk-ins and also those who make reservation through the phone at +6082532111 extension 1196. Cheaper prices are available online at www.GrandMargherita.com, with prices starting at RM69. Stay-in hotel guest of Grand Margherita Hotel are entitled for a 20% discount of the publish prices (Roughly RM74/person for adults). Last minute room rates at Grand Margherita Hotel start at RM158/night, but rates can fluctuate according to season and demand. I really enjoyed my experience at the Grand Margherita Hotel Kuching Ramadhan Buffet because there’s plenty of good food to choose from. The latest renovation of the whole buffet area has made it very airy and spacious. 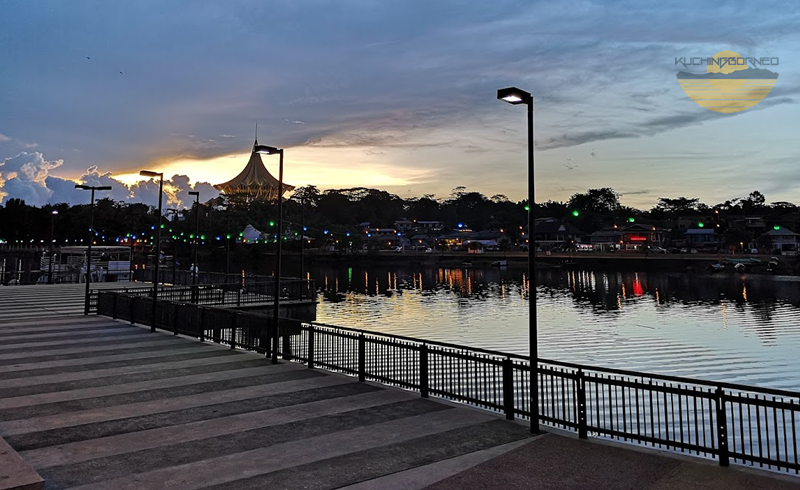 The view from the buffet area is also special with the Sarawak river just beside the buffet area, and the majestic Sarawak State Legislative Building as a background. If you went to the Grand Margherita Hotel Kuching Ramadhan Buffet let me know what you think. If you have questions, just leave a comment below.